Largely led by sport, bigger OB companies have started building 4K trucks and the subscription television providers such as BT Group and Sky have been fueling this by distributing 4K content as the potential for revenue increased. There's been some reluctance from facilities providers to jump into this new format, mainly due to the lack of agreed standards. No one wants to get stuck into a format or a workflow that may be obsolete in a few years. Due to this, there's been an increase in new industry bodies, initiatives and protocols that are helping drive the development of 4K production, including The TICO Alliance which "wants to help grow the UHDTV ecosystem" and Aspen, an IP protocol. With the consumer in mind, other bodies exist such as the UHD Alliance although this seems more driven by selling TVs because they've got the 4K logo on them! However, it's clear that there's been a constant conflict between the standardisation and adoption of formats, the telecommunications companies (Sky, BT Group etc. ), broadcast equipment manufacturers (which have been fervently pushing each of their own flavours of 4K workflows) and the consumer television manufacturers. On the consumer side, there's a sense that the public has now embraced 4K - any excuse to spend more money! But what has the shift to 4K meant for the mainstream people and companies in the broadcast industry - the production companies and facilities providers? Unless you have very deep pockets, there's a sense that any 4K solution you put together today won't be perfect there'll be compromises and work-arounds to reach the end goal. In this way it's fair to say that 4K isn't quite there' yet. The standardisation issue is a big one. Even the simplest of productions and workflows can already be flawed. For example, a nice new 4K camera et's take a Sony F55 - which outputs quad link SDI will need to feed that into a single link 6G or 12G device. There's a whole new layer conversion and consideration at play. 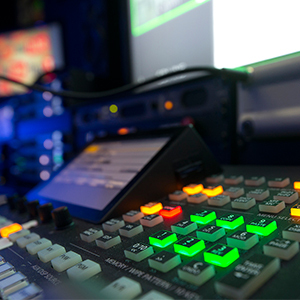 Whether you're a system integrator designing a new studio facility, an outside broadcast truck or perhaps you're contemplating building your own in-house studio, it's a really tough time. 4K is here and it's accessible, and there's even ways to do it affordably but it's still no easy task. During the summer of 2015 an executive official at the European Broadcasting Union warned electronics makers about the "dangers" of moving too quickly with 4K. Evidently this wasn't listened to which is why we're now struggling with the plethora of different formats ranging from 6G, 12G, QFDH, IP and so on. It feels fairly likely that IP as a transmission method will replace copper, and formats such as quad link will become stepping-stones. 4K over IP is like the M6 toll road; it might cost a bit more but you'll get to your destination quicker. There's also been lots of discussion about the other technologies surrounding 4K that haven't quite settled down such as HDR, higher frame rates and a larger colour space. The new ITU-R Recommendation BT.2020, more commonly known as Rec. 2020, and HDR are actually likely to be what 'sells' 4K to the mass market. A larger resolution is one thing but technologies like HDR and Rec. 2020 change the viewing experience it's more immersive and real. Rec. 709, the current HD standard was developed in 1993! So after such a long time with one standard, something that's such a significant improvement is bound to be well received. HDR will surely have the edge in convincing consumers to buy that new 4K TV; it's a catchy saleable buzzword that feels like it should be spoken by the raspy voice of 'Voice-Over Man'. For the broadcast facility providers and operators, there's a whole new language to learn. Workflows and roles are changing. From a live production point of view though, it's an exciting time as we can realistically produce 4K productions now. The requirement for multi-camera 4K productions is increasing. Not only is there the obvious sport coverage that we mentioned earlier but also live music and events ripe for 4K acquisition. With decreased costs and increased availability, it's now possible for smaller companies like ourselves to do multicam 4K at a reasonable cost. Our 4K multi-camera facilities include a full flyaway gallery with various options for cameras. We can use the new Sony HDC-4300 4K system cameras or for that cinematic look, Sony PMW-F55s with 4K fibre camera adaptor systems, which along with transmitting the video signal over long distances of fibre also offers all the traditional multi-camera facilities: talkback, tally, return video, camera engineering control (racking) etc.